If Mr. Wasiu Olaitan had kept his tradition of not going out to work on Thursdays, perhaps he would have been in the comfort of his home today – hale and hearty. A 41-year-old commercial bus driver, who augments his daily income by operating as a vulcaniser by the side, the father of three invests much of his energy and time into productive activities that would help put food on the table for his family. Abandoning his native Ile-Ife, an ancient town in Osun State boasting of a rich culture and tradition, several years ago in favour of Lagos where his search for a better life has continued, Alawasi, as he is fondly called by those close to him, has not really had it easy over time. Though managing to build a small house in the Ibafo area of Ogun State to shelter his family, the middle-aged man has continued to contend with all manner of struggles in his quest for a major breakthrough in life. On Thursday afternoon, while ferrying passengers in his 18-seater bus from Lagos to the Mowe/Ibafo area of neighbouring Ogun, a bigger worry was added to Olaitan’s growing list. A speeding tanker laden with around 33, 000 litres of Premium Motor Spirit – one of the deadliest and easily combustible liquids in the world – that had lost control suddenly fell a few metres away from Otedola Bridge, a popular axis along the Lagos/Ibadan Expressway, spilling its content all over the place and bursting into flames shortly afterwards. The 41-year-old whose commercial bus was directly behind the ill-fated tanker, the moment brought a glimpse of perhaps what the end of the world would look like. 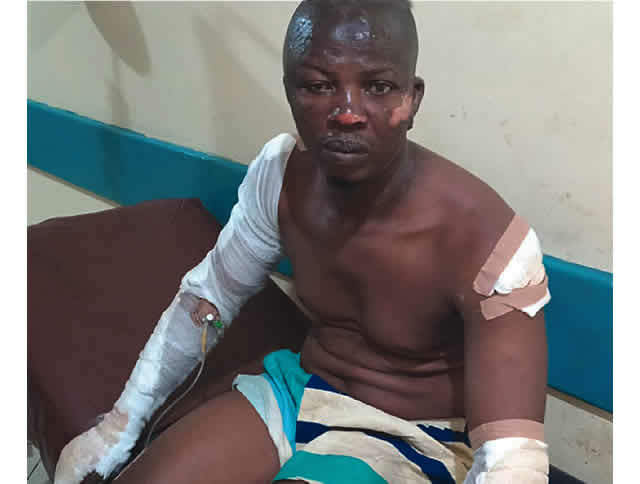 “I saw darkness everywhere immediately the tanker exploded,” he said while speaking with reporters on Friday on his hospital bed where yards of bandages now strapped him like an armour. “I thought I was going to die. It was as if the end had come. There was commotion everywhere, just like in a war. Nothing else came to my mind. We all believed it was the end,” he added soberly as he narrated his ordeal to his teary-eyed wife – Faidat – and other family members, who had come to check on him on Friday morning. One of our correspondents, who was at the Trauma and Burns wing of the Gbagada General Hospital where he and a handful other victims of the tragedy are being treated, went in with the party after posing to security men as his relative. While attributing his narrow escape to divine grace, the Ile-Ife indigene said that for a few minutes after the tanker fell, he and others in the vehicle were confused as to what to do. He revealed that it was while it was being argued that the content of the truck was diesel or petrol that the entire place erupted in flames. According to him, after being briefly knocked out by the sound of the explosion, he managed to regain consciousness and enough strength to force his way out of the bus through the front passenger seat. But even after exiting the vehicle, his fears were far from over. “I jumped into a gutter full of dirty water immediately I forced my way out of the bus,” he said, slowly adjusting his sitting position on the bed. “I had hoped to use the water to quench the fire on my body but unknown to me the water had already mixed with the petrol that had spilled from the tanker. That compounded my problem. While I was struggling to quench the fire on my body, I did not know that my head was burning. I managed to run across the road and into an uncompleted building where people around helped me put out the fire. That was my saving grace, otherwise only God knows what would have happened to me,” he stated. Revealing how the tragedy and her husband’s present condition had affected their life as a family, Faidat told reporters that things had not remained the same since Thursday. According to her, they had expended almost all the money on them in trying to save his life. “This tragedy has completely changed our life as a family,” she began. “The thought of him lying in the hospital and battling for survival has left us restless. “My husband usually does not go out on Thursdays. No matter how much you offer him, he would not go to work on that day. But he went out to work that day because he was arrested by LASTMA operatives on Monday and he used all the money he realised to settle them. He had no money on him and that was why he decided to go out on Thursday to work. “I heard of the incident from one of our neighbours whose shop I had gone to buy something. Immediately I got into the house, I called my husband’s number but it was switched off. I called one of our children to warn him not to come home yet because of the incident but his number didn’t go through. Later, my husband used one of the nurses’ numbers to call and inform me that he was involved in the incident. “I was really scared when I heard the news. In fact, all sorts of thoughts came to my mind but I thank God that he didn’t die. We are praying for his recovery now,” she said. Like the rest of the victims affected by Thursday’s deadly inferno, Mr. Wasiu Amoo had no inkling of what laid in wait for him when he left his home at Ibafo for work at nearby Kara that fateful morning. A dealer in granite and other building materials in the area, the 68-year-old, who lost his wife and best friend of several decades about three years ago, after completing another productive day at work, was heading home that evening when the commercial bus he boarded was caught up in the tragedy. While other younger passengers managed to escape with minor burns and injuries, Amoo, perhaps due to age, couldn’t summon a similar swiftness. By the time he managed to drag himself to safety, there had been significant damage done to his aging body. He hangs precariously unto life at the Lagos hospital. “Large parts of his body were severely burnt,” the 68-year-old’s daughter and fifth child, Aminat told Saturday PUNCH during an encounter on Friday. “He has not been able to open his eyes since that incident. Initially, he was not able to talk but after oxygen was administered on him on Friday morning, he had been talking gradually. “Also, since that incident, he had not been able to urinate on his own; the nurses have been using a device to assist him to do that. He has been complaining of pains. “We are praying to God to preserve his life. He is a good father; we cannot afford to lose him now. Since we lost our mother three years ago, he has been playing both roles for us. We beg God to spare his life,” she said. Asked if there was any sort of premonition of something terrible happening before the incident, Aminat, who lives with her husband in the Ikorodu area of Lagos, said that though she wouldn’t say that there was a warning, she had felt uneasy for about three days prior to the tragedy without knowing what the problem actually was. “For about three days before the incident, I was always having bad feelings,” she disclosed. “I couldn’t explain what the problem was. I had to embark on a seven-day fast to ward off any evil from my family. But on Thursday evening, I got the news through an uncle. We have not been at peace ever since,” she added. Also lucky to be alive is Mr. Seun Solarin, an official of the Federal High Court, Ikoyi, Lagos, who escaped death by mere inches. The young man returning home from work with three colleagues and a few others in a Mitsubishi space wagon that fateful evening was rushing to go and watch the ongoing FIFA World Cup taking place in Russia before things took a different turn. In a few deadly seconds, daylight turned to raging storm of fire that threatened to consume him and others inside the vehicle. Despite sustaining slight injury, Solarin is grateful to have lived to tell his story. “If anybody told me I’d still be alive by now, I would doubt it,” he said, still looking frightened. “I saw it; I was there, in front of a huge fire, in front of death. I was sitting beside the driver, Williams, my colleague when everything happened. I thought war had broken out. I was afraid that life had come to an end. “Before the incident, I and Williams noticed how the tanker was manoeuvring anyhow. The tanker driver was waving at other vehicles behind not to come close. As it approached Oando Filling Station, there was traffic and the driver decided not to move forward again. As he tilted the tanker towards the culvert in the middle of the road so that it would stop, the tanker started descending. One of the motor boys quickly disembarked and started throwing a big wood in front of the tyre to stop it. But the tanker climbed a stone and fell. Fuel started gushing out but the others said it was diesel and that it wouldn’t explode. “But something told me that even if it was diesel, we were supposed to run for safety. So, I asked everyone in the car to run. I had not run up to 100 metres before the tanker exploded. It was like a bomb exploding in a war. I didn’t look back again until I reached Isheri. “Williams and another colleague, called Aunty Maria are still missing. Another colleague inside the car who managed to escape had his scalp seriously burnt. I pray not to witness anything like this in my life again,” he said as he battled tears.